The fossils from six individuals, including skulls, dated at 1.8 million years old, discovered in 2001 at the foot of the Caucasus mountains that separate the Black Sea from the Caspian Sea, has been claimed by some scientist as reinforcing the OUT of Africa theory for the evolution of Homo sapiens. However the surprise is that the skulls clearly show that these creatures had pea brains with a volume of half the size of Homo erectus. This has thrown all previous assumptions of the evolution of our ancestors into chaos. Previously it was thought that our ancestors that came out of Africa were large brained Homo erectus. The Dmanisi skull instead shows that these creatures had faces and bodies like those of chimps with long dangling arms and short legs. Dmanisi looks more like Homo habilis, the creatures that started making primitive tools 2.4 million years ago in the Olduvai Gorge in Tanzania. In fact it could be said that they looked more like 7 million year old . The Toumai from Chad than anything else yet found. A brilliant article by Rick Gore in the National Geographic of August 2002 gives a full account of the Georgian discovery while posing the question demonstrated by the Time Charts below. 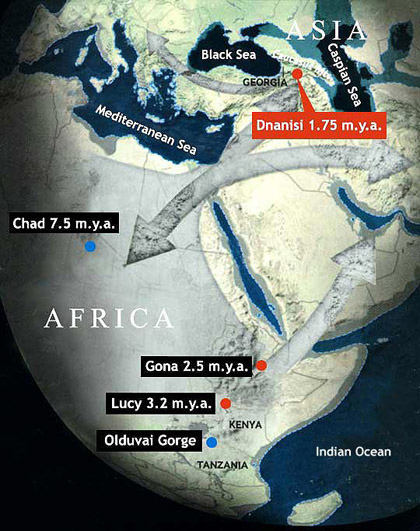 Were they already there having spread out before the Mediterranean flooded 5.5 million years ago. If the date for Toumai from Chad of 7 million years is correct then this would have been possible. Map showing selected early sites of humans.